My work is pretty much all computer-based, sitting in front of the monitor for hours a day. I enjoy having music on in the background or some NPR podcasts (what’s a day without Fresh Air?) but since a lot of the work I do is technical writing, music with lyrics and shows with interviews and opinions can interfere with my writing. So recently I returned to classical music and opened a can of memories from secondary school drafting class. Drafting was a large part of my secondary school life. 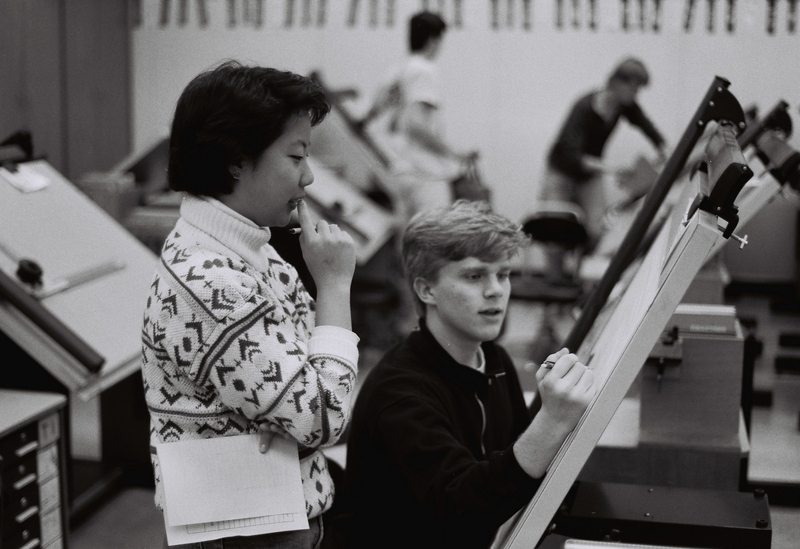 After an initial mechanical drafting class in 8th grade, I studied architectural drafting for my three remaining years and became quite good at it, winning a prize at the county fair and participating in some statewide competitions through VICA – the Vocational Industrial Clubs of America – kind of a 4-H for the vocational set. It is now known as SkillsUSA. 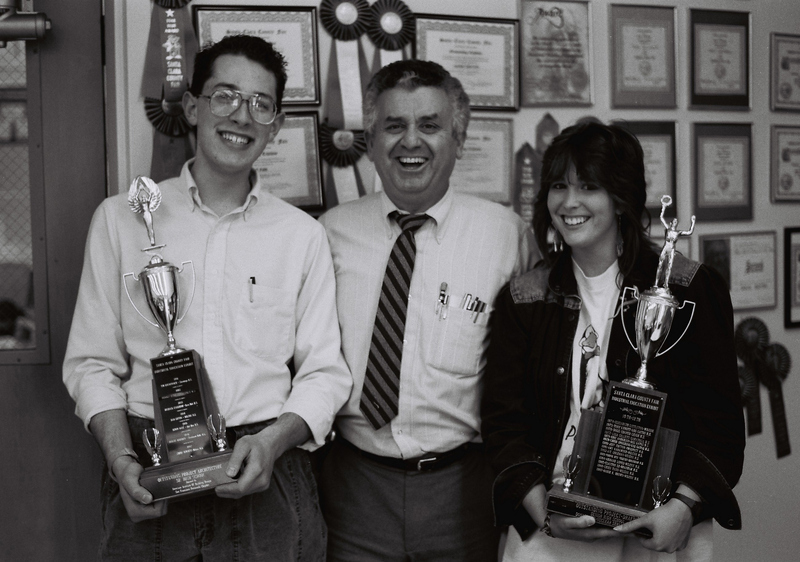 Me, Mr. Geraci, and Marie Brown with our Santa Clara County Fair drafting trophies. My teacher was Mr. Frank Geraci, without a doubt the teacher who had a greater influence on me than any other. In addition to teaching his students about drafting, he taught them about so many other important life skills: organization, preparation, patience, respect for the “right way” of doing things, leadership, communication, etc. He even taught us about constitutional law: though he was a faithful Catholic, he was also a staunch believer of the separation of church and state and when we would recite the Pledge of Allegiance (the the US flag) he would remain silent for the words “under God” as he believed they had no business being in there. High school classmates Joyce and Scott. Anyhow, back to classical music. After giving whatever instructions and announcements he might at the start of class, Mr. Geraci would set us to work and turn on the radio, which was tuned to KDFC 102.1 FM, a 64-year old San Francisco Bay Area institution that is the most listened-to classical radio station in the United States. So we would work away for the fifty minutes or however long the class period was, to the strains of Mahler, Mendelssohn, and Mozart. Except for Fridays. On Fridays, Mr. Geraci would cede control of the tuning dial to the students so we could listen to our choice of stations, provided he could retain control of the volume dial. So once again I find myself listening to KDFC as I diligently work, this time by streaming over the internet instead of over a decades-old stereo, making the hours go by pleasantly. And as I listen and work, I find waves of memories from nearly a quarter-century ago lapping over me. This entry was posted in Uncategorized and tagged classical, drafting, Geraci, high school, KDFC, memories, Music, radio, secondary school, working by christao408. Bookmark the permalink. Looking at the photo, I do notice some subtle differences (coke bottle glasses and hair!!). By the way, I wonder where’s Mr.Geraci, and your classmates are now? Listening to Canto pop and Carpenters do bring back memories of my school days in Hong Kong. KUSC does a pretty good job here, too! And there used to be an AM station, but I think we’ve lost them. Love those old photos!! It’s amazing how memories can linger for so many years to come. As for drafting–I had to take it in grade eight, and I think that’s an area that I didn’t particularly excel at even though I enjoyed it! We have the local NPR stations broadcasting beautiful, magical classical music too. I loved your geeky glasses Chris. That is one huge trophy. How neat! Hehe! Some things change but the great smile stays the same! I listen to classical music to and from work – WASU classical 24/7 (except for the “commonwealth hour” every Friday). I find it much more pleasant than the other stations playing the hits and misses in the current musical scene. Aww… nice pics from the past! When I work from home, I usually listen to classical music as well. @icapillas – At least a few of them are – I already posted it on facebook! =D@Sinful_Sundae – If more people had this sort of introduction to music at an early age, I think there would be many more people who weren’t “afraid of” classical music. Thanks for sharing the link. @ElusiveWords – Great minds thinking alike and all… Ha ha…@murisopsis – Oh, is that “commonwealth hour” the commonwealth club meeting? I miss that from my local public radio station. Wonder if they have podcasts? @ZSA_MD – I didn’t think they were that geeky, are they? Metal rimmed, aviator style. Very fashionable in the 90s. @lil_squirrel4ever – Sometimes enjoyment and appreciation are more important that excelling in a subject. Math and science both fell into that category for me. @slmret – Seems like there are a lot fewer AM stations these days. Is that just me, or is it true? @CurryPuffy – Scott and his partner live in Philadelphia. The drove up to NY to see us a year ago August when we were there for our honeymoon. Joyce is still in the Bay Area, I think. Mr. Geraci retired a decade or so ago and I’m not sure if he’s still living in the Bay Area or not. I should contact the school district and see if they can forward a letter form me to him. It is so happy to have a good teacher. I envy you. I like using classical music as a background music too. @Made2Order – I made a panna cotta the other day. http://christao408.xanga.com/732484001/sunday-date-brunch/ Turned out nicely, although I felt like the ratio of water to gelatin was off: not all the gelatin was moist so I had to add a little more. I also enjoy listening to classical music when I work. I also love choirs especially old hymns and Christmas music. I love classical music and easy listening jazz – maybe that is because they are the two areas I play on piano. Started in second grade. The smile hasn’t changed a bit. Were you among the ‘geeks’ in your school? hehe! @Dezinerdreams – Thank you. Not exactly. I was very active in a lot of organizations – yearbook editor, head of this vocational club, active in a half-dozen other clubs. Played tennis, although not very well. Wasn’t a jock, for sure, but wasn’t completely in with the geek crowd, either. Was more involved with the “advanced placement” students. I also enjoy classical music from time to time. And I agree, doing technical work requires fuller attention. I can’t code and listen to the radio at the same time; it’s too much of a distraction and I need 100% focus. @christao408 – I’m not sure if that’s true, or just an illusion. In LA, we are so close to Mexico that at least half our AM stations are Mexican language and/or Mexican music stations. Since I don’t speak Spanish, that is pretty limiting!!! Me love classical music too. Whatever happened to the trophy? Haven’t see it around in years. @christao408 – I was just impressed with the size of the lenses. They look huge, but really cool. UC R?Did you know Steven Shum? I had a math teacher in high school that would play classical music while we took tests as he said there had been studies that said listening to classical music helped brain function. Wow I didn’t recognize you in the first pic. 🙂 I think that most of us had an influential teacher in our lives. Just wish more of them were like that rather than being crabby apples. 😛 I also listen to classical at work, although a Canadian channel (CBC Classical). Perhaps I’ll give your station a whirl. You were such a high-achiever. And it’s beautiful how you now find yourself taken back to a place 25 years earlier. it’s always nice to go down the memory lane. i can only wish that i have someone in my past life that have inspired me in some way.